I am a sucker for stitch dictionaries. In my library, where space is sorely limited, about half the knitting section is given over to them. The oldest is from the mid-19th century. The newest arrived last week. What’s the appeal? How many lace edgings can one person knit in a lifetime? How many variations of basket weave? How many ways do you need to work a bobble? I’ve just spent a month weeding the collection and about 150 pounds of fiber arts titles went out the door. It was an act of desperation. 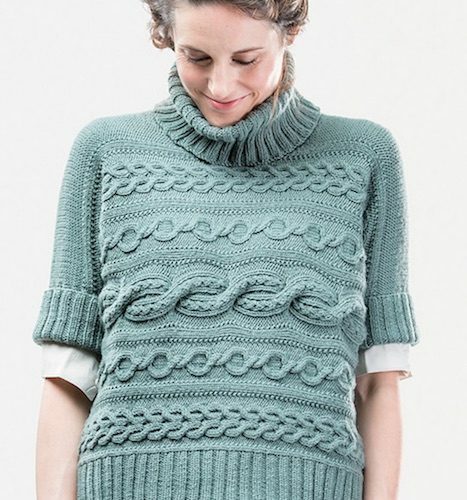 Even so, when Abrams announced Norah Gaughan’s Knitted Cable Sourcebook: A Breakthrough Guide to Knitting with Cables and Designing Your Own with a press release promising “more than 150 stitch patterns,” I went all grabby-hands over it. Never mind that I have two dictionaries devoted to cables already. The difference: those dictionaries are only dictionaries. They show you a cable, they give you the recipe for it. 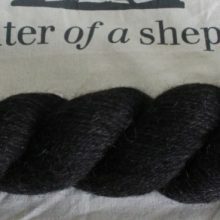 If you are an analytical sort and find thoughtful swatching to be oodles of fun, such dictionaries will slowly educate you in the underlying principles of cable knitting. Should you prefer to use the book as a dictionary, of course you may. What’s lovely is that almost none of the stitches presented are stitches you will have seen before, so you won’t have spent your money only to be confronted with the usual suspects. The very simplest rope and braids are, the author admits, common and basic. But they’re no more than springboards to variations that will make you see them anew. That would be enough to make the book worthwhile. The addition of 150 new varieties to the breeding population is an achievement on its own. 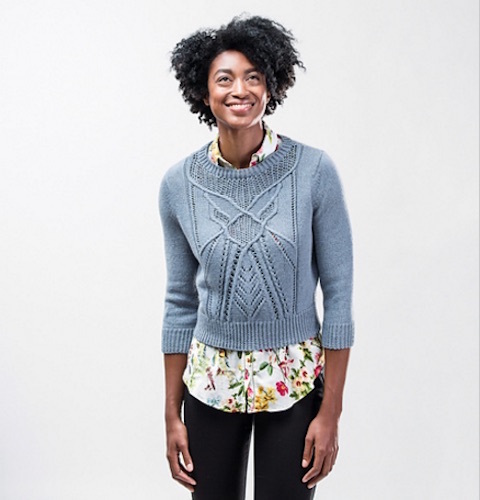 But in presenting her new stitch patterns, Gaughan describes with clarity—even an advanced beginner should be able to follow along—how one cable design was altered to morph it into another. In Chapter Five, “Finding Motifs,” she presents this on a dazzling scale as one cable (aptly dubbed “Fave”) becomes first a series of new panels, then a series of independent repeating motifs, then a single medallion, “Free Ogee,” that floats majestically on a bed of stockinette stitch. The variations are so clever and skillful that most aren’t immediately recognizable as descendants of Fave. The notes on how the transformations were brought about raises the exciting possibility that you, the reader, are capable of working similar magic. 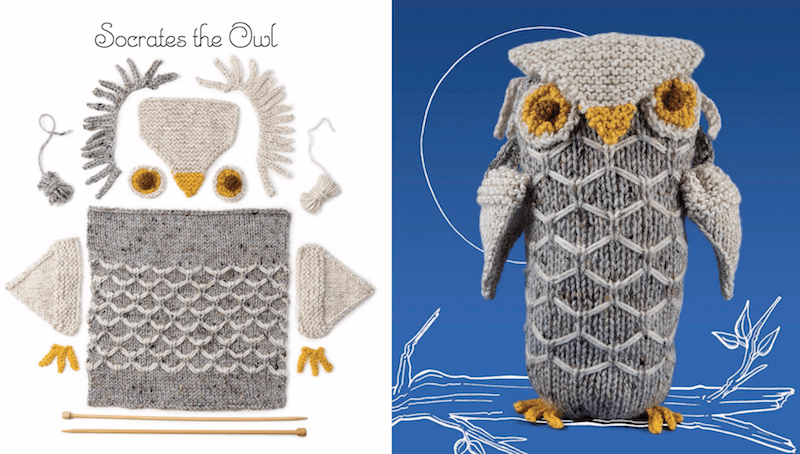 Knitters new to cables might not yet feel ready for that level of engagement. For them, there’s an opening chapter of “Essentials” (yarns, tools, crossing left and right, chart reading, cable vocabulary, and troubleshooting). 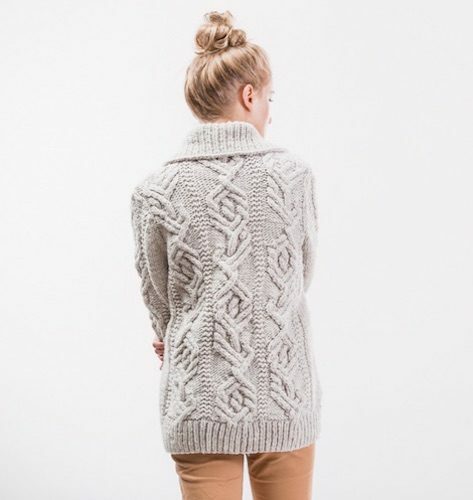 Among these is her clever Stockinette Stitch Equivalent System (SSE) which helps in substituting one cable for another, or in using a cable in place of plain stockinette. 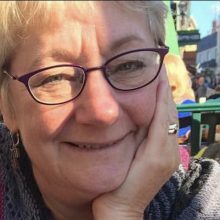 Everything is presented in the calm voice of an experienced teacher who has steadied a lot of trembling needles. The remainder of the book examines cable motifs in order of increasing complexity. The sixth chapter, “Drawing,” lays out methods for using the lines and shapes created by cabling to “draw” original allover designs, panels, and large non-repeating shapes. Graduate level work, to be sure. And so, so, so rich in possibility. Following each chapter are multiple patterns that put into practice the preceding material. 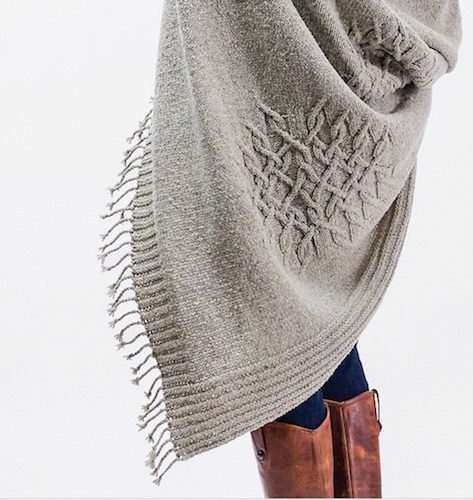 As capably photographed by Jared Flood, they appear true to Gaughan’s signature style: shapes and textures interesting enough to make you look twice; but not so interesting as to be unwearable. 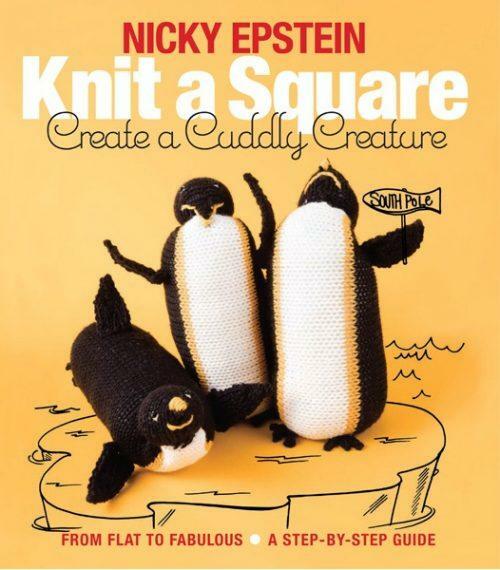 Nicky Epstein’s newest book, Knit a Square, Create a Cuddly Creature (Nicky Epstein Books/Sixth & Spring) isn’t explicitly aimed at the knitting-with-kids market. There are no adorable moppets wielding fat needles in the photographs. The title hasn’t been scrawled across the cover with a fistful of Crayolas. Yet she may have hit on the best formula yet for drawing the young ones into the fold. Children, in my experience, are seldom drawn to knitting as means of winding down after a long day. They want to knit so they can make stuff; but there’s so little that they—especially the very youngest—can make. Scarves are long and grow tedious. Washcloths are shorter, but it’s a rare kid who’s excited about washing the dishes. 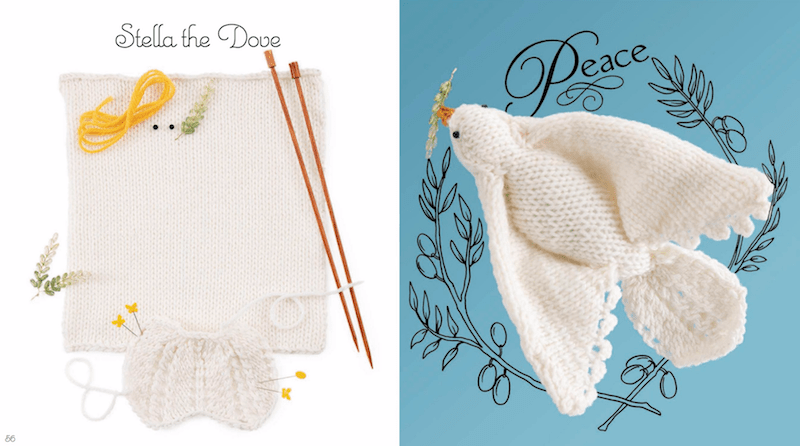 Beyond the classic pattern for a garter stitch square folded into a bunny, pickings are slim. Epstein’s book takes the idea of the square-into-bunny and makes it truly fascinating. Each of the patterns—there are more than three dozen—yields a cute animal suitable for hugging and/or display purposes. A few, indeed, use only the square. Most begin with the square, then add on various simple bits and bobs for the finishing touches. All are shaped with hand stitching (not much of it) basic enough to be well within the grasp of the adventurous beginner. Given the simplicity of the approach, the parade of finished projects is astonishing. None has the boxy, bland look you might expect from the square beginning. Owl, cat, fox, armadillo, flying pig, dove, penguin, sheep, dragon—the farm, the forest, and the fantasy world are all represented. Subtle touches in shaping and decorating give each pattern a distinct look and appeal. Kids who won’t finish a washcloth may well find a polar bear or dachshund to be a goal worthy of completion–albeit with the help of an adult mentor. The kid works the square, the adult works the other little doodads and supervises or completes the finishing. And it’s likely, I suspect, that the adult will find the process as amusing as the kid. Come to that, an adult with no child in sight who wants to expand his or her toolkit of techniques could do worse than making up the animals that include basic stranded color work, intarsia, beading, textures, and simple lace. Come to that, I teach stranded colorwork and I want to make the Fair Isle cat right this minute. 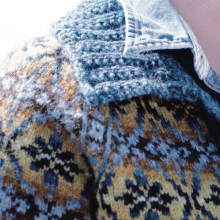 Photographs from Norah Gaughan’s Knitted Cable Sourcebook are by Jared FLOOD. You had me at stockinette stitch equivalent! That sounds like something worth the price of admission. Always love to read your reviews, Franklin (and anything else you write). In this case, you’ve raised my already high expectations for Norah’s new book, which I ordered yesterday! I have a longtime love of cables, and of Norah’s patterns. 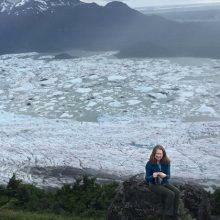 That blue fitted pullover is exactly what my daughter recently requested- so much texture! And I want to make that sideways turtleneck for myself. Excited to add this to my rather extensive knitting library. I bought Gaughan’s new book right away even though I’m trying not to buy more books. . .and that Epstein book looks adorable. You are a Titan of inspiration. I think I may need a fair isle cat too. I recently saw Epstein’s book, it’s fabulous! The ideas are great! I need these books. Yes, need. Plus I have a granddaughter who wants to learn to knit. I see definite possibilities. Franklin, I’ve loved you for lo these many years, and love the book reviews you are giving us at MDK. And I understand you u only revie books you love and put them in the best light, which appreciate on many levels. 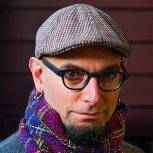 But, yeah, sorry for the but… I think you do t give enough credit to what kids can and will make with knitting. Afterall if they made themselves a sweater it’s still pretty small. Sorry, just had to stick up for all the kids out there who would do more of only given the chance. Yes, at age 4 I had to *force* my impatien non-teaching mother to teach me to knit. Why do you ask? Luckily my age 6 I was friend S with a neighbor who had me join in on her idea to crochet 7 Christmas ponchos for her grand nieces. And to my delight there was one for me — variegated purple! In the 70s nothing could have been better! I’m writing from my personal experience, which is all I can speak to. And in my experience, most kids – most – are not excited by dishcloths and are too impatient for scarves. If a kid is exceptional – fantastic. They should be encouraged. But again, I am writing from my own experience and speaking of the majority, not the exceptions. 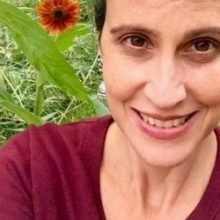 Me, I was an exception – desperate to sew, knit, and crochet at a young age and forbidden to do any of them because of my gender. I am so in love with the Norah Gaughan book. I got it for Christmas this year and it is like a compilation volume of fairy tales of knitting. I am putting these on my list for my upcoming birthday. If I don’t pick them up before that…..
Oh, Franklin, you writing wizard! Your reviews are magic. I don’t even like cables, and I put the Norah Gaughan book on hold at the library. (I love her work, and the book Knitting Nature in particular, though.) And…I adore easy, whimsical knitting, so I plan to purchase the Epstein book at the earliest opportunity! Thanks for letting me know about it. GAH. Nobody told me there was a dachshund. I was fine until you said dachshund. Great info & written in a way that encourages exploration of a wonderful tool. Fair isle kitty? Must. Knit. 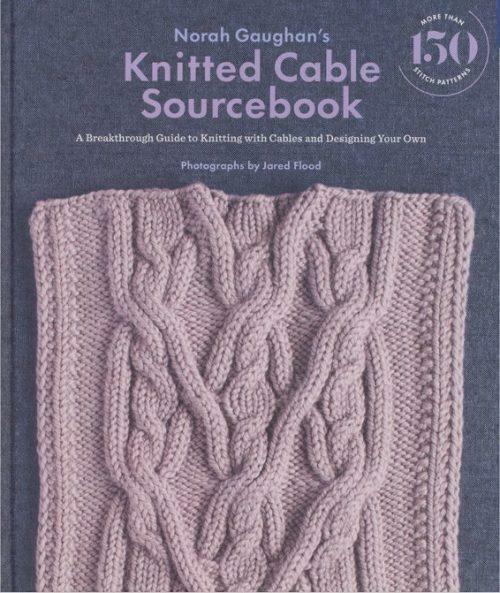 And I already purchased Norah Gaughan’s cable book last fall, right after taking her reversible cables class at Columbia Gorge Fiber Festival. My bookshelf needs a clearing, but that book is not leaving. So nice to see you last week at Madrona! Wow ! Well written Franklin and now I want to go buy both! I have more knitting books than I can count but my daughter just learned to knit and I love designing with cables. Off to the store I go! After reading your reviews, I promptly ordered both books. 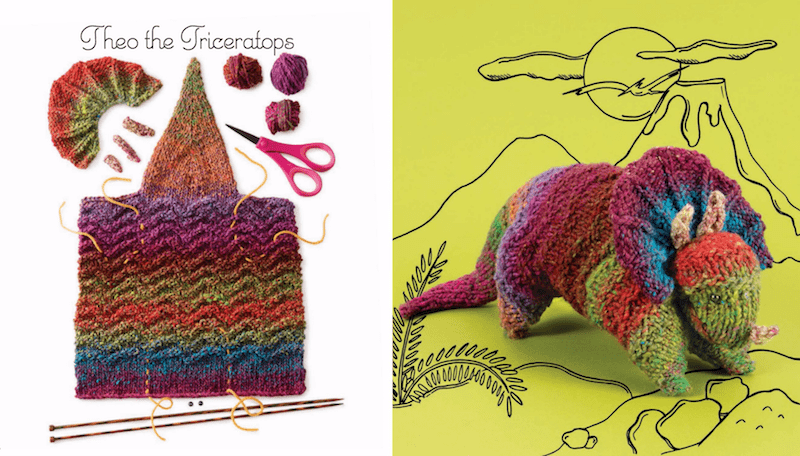 Who knows – maybe I’ll knit a cable-encrusted creature made of knitted squares!